The ultimate whole body cell-supporting formula! Scientists now know how to achieve optimum wellness and vibrant health: Feed your cells the right nutrients… in the right amounts… at the right time! Excess free radicals: These are the nasty, unstable molecules that break down healthy cells and prematurely age your body! Glycation: Creates "glue" that latches on to healthy cells and turns them into damaged cells! Abnormal methylation: Causes abnormal cell division - which can accelerate the aging process! Chronic inflammation! Prolonged and excessive inflammation is not part of the normal inflammatory response process that occurs every day in the body. Chronic inflammation creates toxic chemicals that “eat away” at body tissues and upset your body's natural balance! Cellular degeneration: Genetic cell instructions and codes become corrupt - and create sicker and weaker cells! To support your body against these 5 main causes of aging and reach the goal of optimum cell health - you can’t rely on ordinary vitamins and supplements. You need a comprehensive, whole body formula that directs nutrients to your cells at the right time. That’s the optimum way to experience healthy cell life! Over 14 years ago, we pioneered the creation of a revolutionary nutrient system that delivers critical and customized nutrients your cells need… at the right amount… and at the right time - to nourish your body and support heathy systemic functions. With these optimum nutrients at your disposal - you’ll help support the healthy functioning of the cells throughout your body. This exclusive complete nutrient system - called Total Balance Unisex Standard - is tailored to fit the specific cellular nutritional needs of men and women - at every age and health level! As new, proven research comes to light - we continue to enhance and fine tune the Total Balance Unisex Standard formula to ensure that you get the nutrients your cells need to thrive! Now, in its 8th generation of formulation - you can be certain our exclusive Total Balance Unisex Standard formula - delivers a superior and Complete Nutrient System - with 74 targeted vitamins, minerals, enzymes, amino acids and age-defying nutrients to support cell health and function! Don’t just defy the aging process – boost your energy levels and vitality… and support mental clarity and general health no matter what your age! Complete Nutrient System for optimum cell health support: You get 74 potent vitamins, minerals, enzymes, amino acids and micro nutrients to feed your cells - at the right time - for cell health support and function! Taking the full dose of just 4 tablets per day gives you an affordable formula to support optimum health!. Age-defying nutrients: Potent antioxidants to help fight off the effects of cell aging… premature wrinkles… and “old age” health problems! Plus - you get support for healthy cell growth! Economical formula for men and women: Because Total Balance Unisex Standard contains no additional hormonal support - it can be taken by men and women! This makes the Total Balance Unisex Standard an economical option for households on a budget! Recommended dose is just 4 tablets per day! More potent vitamins than ordinary multis! Because we deliver the RIGHT vitamins in the RIGHT forms your body needs! You expect to get vitamins A, C, E, D3, K2, B6 and B12 in a nutritional formula to help you defy aging and enhance your health - but did you know many of the vitamins used by other supplement companies are synthetic - and not easily absorbed by your body? Vitamin E is an important fat soluble antioxidant which - in its natural form - contains a synergistic balance of health boosting nutrients: in the form of Tocopherols and Tocotrienols. However, the common Vitamin E used in most multi-vitamins - contains only one of the eight compounds - Alpha-Tocopherol. Why does this matter? Well, you need a balance of both Tocopherols and Tocotrienols to experience the maximum power of Vitamin E! In fact, Vitamin E without Tocotrienols is like a driving a car with only 3 wheels! A healthy cardiovascular and circulatory system! By providing you with only 1 of the powerful forms of Vitamin E you need - can you see how regular multi-vitamins are simply not getting the job done to protect your health? Total Balance™ Unisex Standard contains an all-natural form of Tocotrienols and Tocopherols called Tocomin®. This remarkable nutrient - derived from palm oil - contains all four of the potent Tocotrienols and Alpha-Tocopherol needed to get the spectrum of antioxidant support you need from Vitamin E! Tocopherols and Tocotrienols that are essential for optimal health! You may know the benefits of Vitamin B6 - but did you know that it’s the much more expensive form of Vitamin B6 called Pyridoxal-5-phosphate that delivers the goods? It’s true! This form is scientifically proven to be most effective and bioavailable for your body - that’s what you get in every serving of Total Balance™ Unisex Standard! We spare no cost to provide you with the BEST, most bio-available forms of vitamins and other important nutrients. So you can THROW AWAY your current multi-vitamin formula - and many of your other supplements too! You’ll get the right vitamins and nutrients delivered to the right cells… at the right time… in the most absorbable and effective form… at optimum levels for a healthy, new YOU - in every serving of Total Balance™ Unisex Standard! Powerful antioxidants to deal with free radicals! L-Glutathione: If they use it at all - most manufacturers opt for the less expensive large molecule form of L-Glutathione. What most people don’t know is that this form is ineffective for two reasons. First of all, the large molecule will not pass through the intestinal walls into the blood stream. It’s simply too big! Secondly, this molecule can get easily damaged by acid as it passes through the stomach - well before it can be released in the upper intestine. In other words, you would get no benefit from this potentially powerful antioxidant in a normal supplement! To create the Total Balance™ Unisex Standard - we use only a special reduced glutathione in a low molecular size for maximum absorption. That way you can experience the full benefit of this powerhouse antioxidant! We also use a special enteric coating process to protect this delicate nutrient from stomach acids - so it can pass through the stomach unharmed and then be released in the upper intestine - where it’s needed! Minerals and Micro nutrients for cell fuel! Without the right amount of minerals, vitamins, proteins, enzymes and amino acids - your body can’t function properly. So how do you know you’re getting enough of these critical nutrients? Simple...by taking Total Balance Unisex Standard! Total Balance Unisex contains potent bio-available nutrients to fuel your cells! Total Balance Unisex Standard also contains other lesser known - but highly effective micro-nutrients. However, there are so many of these micro-nutrients - we simply can’t list them all here - but you can refer to the ingredients page for full details. Now your cells can tap into these critical nutrients - when they need them - for optimum cell health - thanks to Total Balance™ Unisex Standard! Amino acids for building protein and boosting metabolism! Proteins control virtually all cellular processes. So without available proteins - at the right time - healthy cellular function may not be possible! Thanks to the Total Balance™ Unisex Standard formula - you get a synergistic blend of essential as well as non-essential amino acids to support cell repair and regeneration! These include L-Methionine to grow healthy skin, hair and nails… L-Arginine and Taurine for immune and muscle support… L-Tyrosine to support healthy stress management and improve your mood… L-Carnosine to support the body’s response to glycation… and the master antioxidant glutathione - in a special low molecular weight - for maximum absorbability. To top it all, we are one of the few manufacturers to include the amino acid SAMe in our formula. SAMe is one of the most potent and scientifically proven methylating agents that can help defy premature aging of your cells. But this wonder nutrient is rarely included in a multi-vitamin and mineral formula. Why? Because SAMe is very costly and susceptible to damage from stomach acids - it must be enteric coated for you to experience the benefits. But don’t worry - you’ll get this cell supporting amino acid - and many more potent nutrients - in every serving of Total Balance™ Unisex Standard. Enzymes to help trigger cell activity! Your body can work WONDERS! Just like any healthy functioning body would if it had the right enzymes at the right time in the right areas. That's why Total Balance Unisex Standard delivers powerful enzymes such as Bromelain, Amylase and Lipase to boost bioavailability of the nutrients - and deliver nutrients to cells. To turbo charge the bioavailability of nutrients even further - we add something “spicy” - black pepper! That’s right - black pepper in the form called Piperine - has been shown to enhance absorption of nutrients - for maximum health and wellness! Eye health blend for healthy vision! This includes targeted eye-nourishing nutrients such as Zeaxanthin to manage free radicals that attack your eyes... Rutin to support healthy eye pressure... Lutein and Astaxanthin to support eye health... and Bilberry extract to maintain healthy eye function! And much, MUCH more! A Complete Nutrient System - without swallowing a boatload of pills! Think about this: You’d have to buy over 10 different products and take nearly 35 pills per day - to come close to getting all the powerful nutrients found in Total Balance. What’s more: The costs of purchasing all these nutrients individually would be sky-high! Now - you can get a Complete Nutrient System - for supporting optimum cell health - in every serving of Total Balance Unisex Standard! The right nutrients delivered to your right cells - at the right time! Thanks to our specialized delivery system - Total Balance Unisex Standard directs targeted nutrients to the right cells - at the right time. With the special enteric coating - nutrients are protected from stomach acids as they travel to the upper intestine. Our formula works on a pH level release system – not simply “time released”. That means nutrients are always delivered to the intestine for effective release and absorption! That’s a crucial element of nutrient delivery success to support a healthy immune system... healthy digestion... reduce free radical damage... support the health of your bones... brain health... and the health and function of your cardiovascular system - and you get it with every serving of Total Balance Unisex Standard! You just can’t go wrong - if you’re looking for a superior and complete nutrient system - that can be taken by men and women - to fuel your cells for energy and vitality - Total Balance Unisex Standard is for you! Does not contain gluten, dairy, soy, peanut or shellfish. If you are pregnant, lactating or taking any medications, please consult your doctor before use. Daily Serving: Adult men or women - 4 tablets. Teenage boys or girls (between the ages of 12 and 18 years) - 2 tablets. Take first thing in the morning or split into 2 doses in the morning and later in the day. Take with or without food. Combines well with our Omega 3 Fish Oil products and Kiwi-Klenz for optimum general health and wellness. 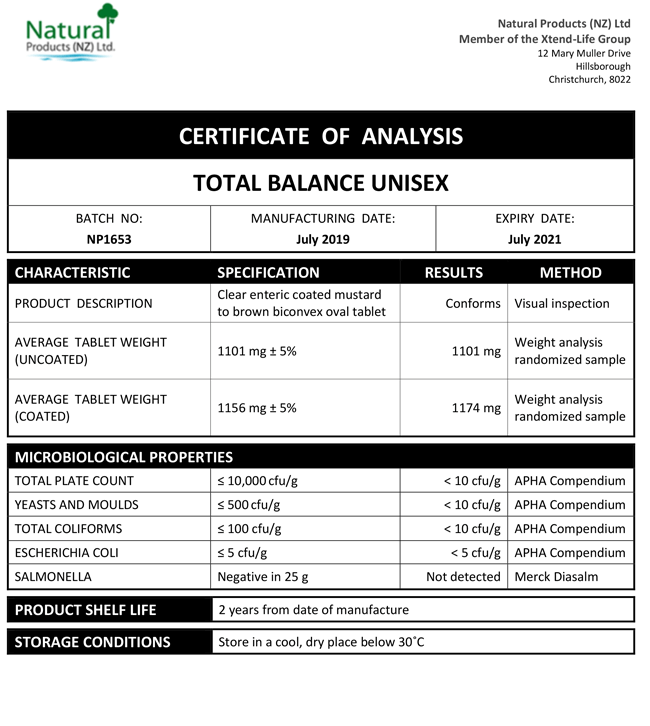 We have included below a copy of a typical Certificate of Analysis (CoA) for our Total Balance Unisex product. You will note that there are two columns which are headed 'Specification' and 'Results' respectively. The specifications are simply our minimum standard to which each batch of Xtend-Life Total Balance Unisex has to conform, otherwise we would not release it. The results are the actual results from the independent laboratory that did the testing. What are the benefits of Total Balance? Total Balance is a complete nutrient system containing an array of essential vitamins, minerals and antioxidants in high quality, bio-available forms. It is designed to provide systemic organ support, support energy levels, the immunity and deliver potent age defying properties. As this product is naturally based, the benefits and time taken to feel these will vary for each individual and will depend on general dietary and lifestyle factors, as well as prior health status. Some benefits you may feel may include an improved sense of overall wellbeing, better ability to manage stress, less frequent colds and flu and increased ability to concentrate. These more noticeable benefits are alongside the many less obvious benefits that Total Balance may deliver for your internal health. It may help to support cardiovascular health, the eyes, the joints, hormone levels and the digestive system. What is the recommended dosage for Total Balance Unisex? Is Total Balance Unisex suitable for teenagers? Total Balance Unisex is certainly suitable for teenagers. We generally recommend this product for teenage boys and girls over the age of twelve. Total Balance Men's and Women's are usually not required during the teenage years, as hormonal support is not normally needed at this time. The normal adult dose is four tablets per day and depending on the needs and body size of the teenager concerned, the dosages will vary. Many teenagers may find good benefits from taking two or three tablets. Please contact us for further dosage advice. Why should I select Total Balance Unisex over the gender specific Total Balance options? Total Balance Unisex has been developed to be used by either gender, from age 12 and upwards. It does not contain any hormonal balancing nutrients as are found in the gender specific versions. The 'space' freed up by the removal of these enables the addition of other valuable nutrients to help address the causes of aging, as well as helping to initiate DNA repair. Total Balance Unisex is the best choice for you if you are a male or female aged under thirty. If you are aged over thirty but do not have any specific hormonal concerns, you may take the Unisex version; this is especially convenient for couples or family members who want the convenience of using the same product. We also suggest this product for post-menopausal women, as the hormone support in Total Balance Women's is not generally required after this time. Can I take Total Balance if I am pregnant or breastfeeding? No, we do not recommend taking Total Balance during pregnancy and breastfeeding. The only product we recommend during this time is our Omega 3/DHA fish oil, which has valuable properties to support both the health of the mother and baby. Fish oil is highly recommended by many medical professionals during pregnancy and breastfeeding to help support infant brain development, as well as systemic organ growth. It can also play a valuable role in supporting the post-natal mood and brain function of the mother. As the baby draws from the mother's precious stores of DHA they can easily become depleted, therefore supporting levels with a supplement such as Omega 3/DHA fish oil is very wise. Will Total Balance interfere with prescription medications? As with all supplements, caution must be taken if you are on medications of any sort. Total Balance contains ingredients like Gingko Biloba, which help thin the blood, so if you are on blood thinning medication this has to be taken into account. It contains a small amount of Vitamin K which may affect blood clotting as well; if you are taking Coumadin / Warfarin please advise your doctor in case your medication needs to be adjusted. No matter the medication, we always suggest checking with your doctor before beginning Total Balance. Generally, there is no problem but it is good to be sure. How is Total Balance Unisex different to Multi-Xtra? Total Balance Unisex is a complete nutrient system containing an array of vitamins and minerals, as well as potent antioxidants, amino acids and age defying ingredients, all in bioavailable forms. Multi-Xtra is a great product in its own right and includes many essential daily nutrients, but it does not include the same amount of 'added extras' that Total Balance does. Total Balance Unisex is best for people wanting a comprehensive, high-quality product, whereas Multi-Xtra is appealing for its affordable, but still high-quality formulation. What is better value for money between Total Balance standard and Total Balance Premium? When purchasing a one month supply, Total Balance Premium is more expensive than the standard version. This is because the dosage of the Premium is higher at 6-7 tablets per day, therefore requiring two bottles per month. This is in comparison to the lesser dosage of the standard version at 4 tablets per day, requiring one bottle for a one month supply. The dosage for the Premium version is recommended for those that are looking for the most optimal product as it contains a comprehensive ingredient range, some of which are in higher amounts than the standard version. It also contains a few unique ingredients not found in the standard version. However, if you would prefer a more affordable option we would recommend the standard version instead, which is still a very advanced and high-quality formulation, including very similar ingredients. Please click on the product links for more information on each of these products.